Solar space heating can be a supplement of a typical residential regular heating system and can dramatically reduce heating costs. GEAR Solar's thermal collector is the basic device in which energy from the sun is transferred into thermal energy. There are two basic types of active solar heating systems based on the type of fluid—either liquid or air—that is heated in the solar energy collectors. Liquid-based systems heat water or an antifreeze solution in the GEAR Solar's thermal energy collector, whereas air-based systems heat air in an 'air collector.' Both of these systems collect and absorb solar radiation, then transfer the solar heat directly to the interior space or to a storage system, from which the heat is distributed. 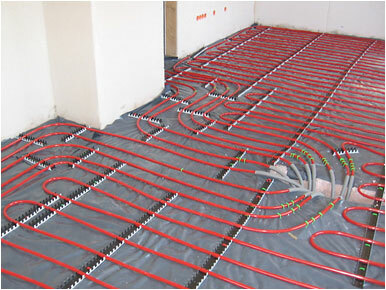 If the system cannot provide adequate space heating, an auxiliary or back-up system provides the additional heat. Active solar space heating systems collect and absorb solar energy and use electric fans or pumps to transfer and distribute the heat. These systems also contain an energy-storage system to provide heat at night or when the sun is not shining. Perhaps the most interesting new solar thermal technology is the absorption chiller – a closed-loop system that converts solar-heated water into air conditioning. Water heated by the sun through evacuated tubes is subjected to a low-pressure loop with lithium bromide, a phase-change catalysts, which causes the water to reach a cool 44 degrees F. This cooled water runs through copper piping; forced air passing over the coils produces air conditioning. Solar thermal cooling is primarily used in commercial settings, but it is becoming more common in residential applications. There are two applications suitable for residential settings where solar thermal energy is used to drive the cooling process. Solar Absorption Cooling uses solar-heated water to drive an air conditioner. The air conditioner uses a liquid that consists of an absorbent and a refrigerant. 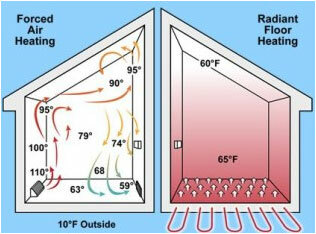 Solar heat is used to separate the absorbent and the refrigerant from each other. The refrigerant is then compressed and evaporated to create a cooling effect for your home. The evaporated refrigerant is then recombined with the absorbent to go through the process again. Solar Desiccant Cooling doesn't really cool the air; it removes moisture from the air which decreases the relative humidity. The moisture is removed by passing the air through a material called a desiccant. As the desiccant absorbs the moisture from the air, it becomes saturated and loses its ability to continue absorbing moisture. At this point, the desiccant is then regenerated, or dried, with solar heat which evaporates the moisture into the outside air. It is then ready to absorb more moisture from the air entering your home.